For the past week the weather in Kuala Lumpur has been on this kind of pattern : super sunny in the mornings and afternoons. Then toward the late afternoon and evening, we will experience heavy rain. Last night we had some major thunderstorm at Mont Kiara area. And that was after such a beautiful sunny day. 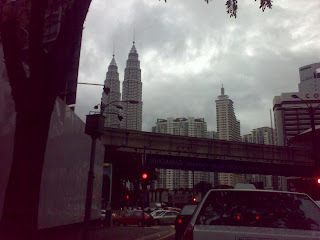 So in case anyone out there planning to visit KL, it's best to plan your activities in the morning and early afternoon.